Courtney Love joins the cast of Sons of Anarchy as Ms. Harrison. Is this Abel's new teacher? "Poor Little Lambs" is the fourth episode of the show's seventh season. The guilt continues to eat away at Gemma. 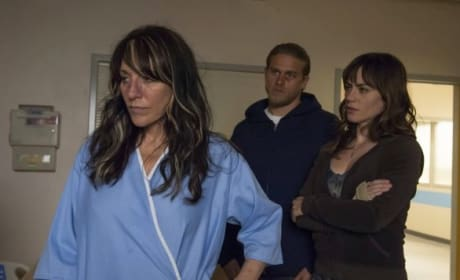 This is a photo from the second episode of SOA's final season. With Tara gone, Gemma and Wendy are now the two women left to take care of Jax's sons. That's a scary thought. Venus Van Dam and Gemma strike a bargain on Sons of Anarchy. "Sweet and Vaded" is the seventh episode of the show's sixth season. 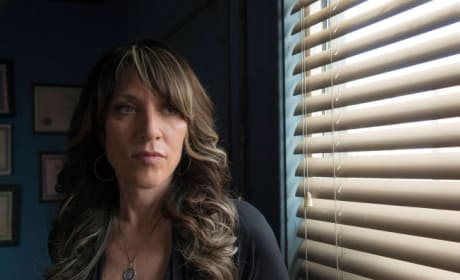 Gemma has a lot to ponder on the Sons of Anarchy Season 6 opener. She stares into the void in this scene. Gemma has hit rock bottom on Sons of Anarchy. Will Tara and Jax ever forgive her? This is somewhat awkward. 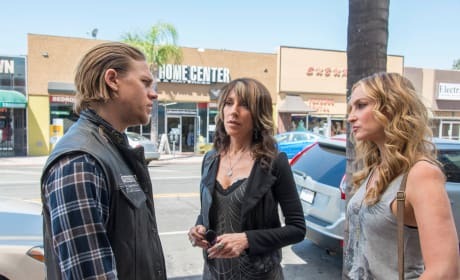 Jax, Gemma and Nero are gathered around in this Sons of Anarchy scene. Nero has made quite the impression on Gemama. And, let's face it, on SOA viwers, too.